Courageous knights, powerful queens, vulnerable kings … no, this isn’t the latest season of Game of Thrones, it’s Roses 2018 Chess. The vibes at this event were unlike anything else at Roses. Complete silence. Complete seriousness. Complete concentration. About three hours in somebody knocked a water bottle onto the floor and it made people jump. 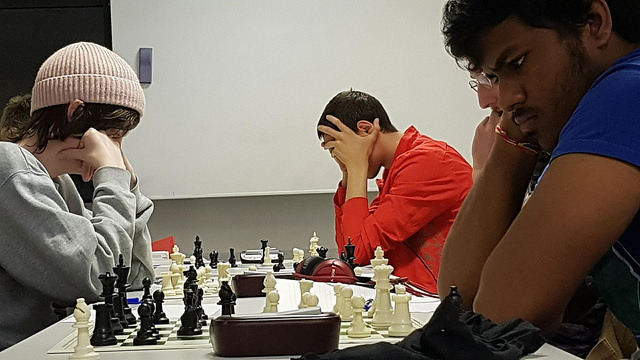 This is not to say the chess wasn’t exciting – if anything, the total silence made it one of the most intense events of the weekend. To add to this, each player has to complete their move within a two-minute window, and has a timer on the table counting down each second. Often players would make use of the full two minutes, calculating the potential repercussions of each move they could make. Although they might have been sat still, their minds were clearly racing, and the time pressure put players on edge. Especially in the early stages of the event, if a piece was taken it was because of an oversight on the player’s part. This year’s event consisted of seven consecutive games. With fifteen minutes remaining, York and Lancaster had claimed three victories each. In the end, it came down to one final match between Lancaster’s Nick Evans and York’s Tom Leah. The two players, both aware of how much depended on each of their moves, played as cautiously and carefully as they could. Evans was the first to get his pieces into a strong formation, and once his castles moved in to attack Leah’s most formidable pieces the knockouts came thick and fast. In the game’s final moments, the intense stillness and strategy gave way to a flurry of action, similar to a game of Mousetrap. In the end, it was Lancaster who got the cheese.